On the Huffington Post, Henry Blodget wrote that young people, bored by what newspapers are doing, may one day get all worked up about it, and not in a good way. Blodgett postulates that, "As 'green business' practices take hold, a new generation of consumers will come to view the newspaper industry as a horrifically wasteful polluter that eats forests, gobbles fuel and electricity, and farts untold amounts of hydrocarbons into the atmosphere -- all to deliver information that might have been interesting yesterday." I've been thinking about that for the past couple weeks and think his prediction has merit. While the level of disdain is unpredictable, the conclusion seems to be unavoidable, even as much as publishers would like to eliminate the costs of paper and fuel. Any paper product, or physical product, can be in for the same criticism, but the short shelf life of the newspaper, its low cost and easy availability seem to make it a likely target. Shortly after Blodget's prediction appeared, I was in Washington, DoC., getting around the city on the Metro. I boarded at the Cleveland Park stop, man pushed a copy of the free Washington Express tabloid into my hands and I carried it with me for about four stops to the Metro Center stop. There, I got off the train and fell in with a few of commuters who trooped past a trash receptacle. Several shoved still-new copies of the Express into it. I snapped a picture. Their copies had been "in circulation" for 15 minutes. That kind of throwaway news consumption could one day lead to subway stop activism. Newspapers can get busy as soon as tomorrow to engage this issue on the field of public opinion. * I frequently see "Please recycle" printed on items that I am not sure can be recycled. Maybe it's just a slogan to them. 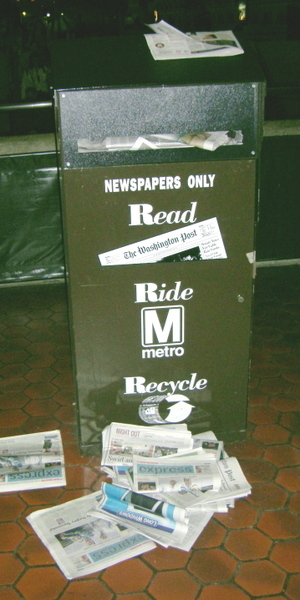 Newspapers can be recycled, should be recycled and are an important segment of the recycling game. When newspaper consumption is reduced, recyclers are hurt. Their business can be jeopardized by a lack of materials or a mix that is increasingly harder to break down. Newspapers can start telling that story. * For years no, newspaper have also helped out recyclers by buying a lot of their product. Newspapers would be doing themselves a favor by stating, on the front page, how much of the paper's content is recycled. Again, let's tell how important the newspapers are to keeoing recycling operations humming. * I have a harder time with arguments about fuel usage. And publishers would just as soon get out from under those costs/ Are their stories to tell about how newspaper drivers plan their routes to conserve fuel or whether the newspaper is an efficient way to deliver? If there is, let's read it. * Finally, and quite aside from how newspapers are printed and delivered, newspapers can use their editorial pages to champion green causes and their news pages to describe environmental issues and efforts.